Caspian terns were first observed in the Prince William Sound - Copper River Delta region, Alaska in 1983, and numbers of hatch-year terns seen in the area have increased since they were first sighted in 1988. The Caspian tern colony on Kokinhenik Bar in the Copper River Delta was first discovered in 2005, when two local fishermen observed a large number of terns flying overhead near the island (Lohse et al. 2008). The first accurate estimate of the size of this colony was conducted on June 4, 2006, when 118 nests containing 1-3 eggs were counted. The colony size had increased to 209 nests containing eggs and/or chicks by June 11, 2008. This colony is the first documented instance of Caspian terns nesting on the Copper River Delta and is the largest known breeding colony for the species in Alaska. In 2009, Dr. Mary Anne Bishop of the Prince William Sound Science Center and Dr. Dan Roby Oregon State University received a small grant from the U.S. Fish and Wildlife Service Coastal Program to assess the Copper River Delta Caspian tern colony. On June 10, 2009, we conducted a survey of the Caspian tern colony on Kokinhenik Bar. Objectives of the survey were to estimate colony size and nesting chronology and to re-sight any banded terns nesting at the site. We flew to the island in a chartered float-plane out of Cordova, Alaska and recorded observations on the southeast section of the island from 11:32 to 17:51. Observers were Mary Anne Bishop, Brad Reynolds (both with the Prince William Sound Science Center), and Yasuko Suzuki (Oregon State University). The island is mostly flat, bare sand, very sparsely vegetated, and littered with driftwood. Caspian terns were nesting in a group on a slightly raised mound. The colony was located at the same site in the southeast section of the island as in 2008 (coordinates at the center of the colony: 60.22653N, 145.17047W). Large numbers of glaucous-winged gulls (rough estimate: 5,000+) were observed in the vicinity of the Caspian tern colony. The majority of gulls were loafing and less than 1% appeared to be nesting on small, vegetated dunes more than 250 yards from the tern colony. Counts of total numbers of individuals and an estimate of numbers of nesting pairs were conducted by three observers using binoculars and spotting scopes from a small dune approximately 270 yards southeast of the tern colony and from other vantage points (behind large pieces of driftwood) closer to the colony. The highest count of individual terns was 314. At least 117 terns appeared to be incubating eggs and/or brooding chicks. Because some terns were behind other terns or driftwood, the total number of terns and the number of terns sitting on nests were thought to be underestimated. Some terns were seen rotating eggs using their bill. No copulation or scraping was observed. From those behaviors, the chronology of the colony appeared to be late incubation to early chick rearing stage. Although there were numerous gulls around the tern colony, we did not observe any tern egg predation by gulls when nesting terns were flushed by us or by bald eagles. Terns re-landed on the colony within 30 seconds following disturbance events. The prompt return of adult terns to their nests and the absence of egg or chick predation by gulls during disturbances led us to believe that a walk-through of the colony to count nests and collect regurgitated fish samples would have a minimal impact on colony productivity. Three observers walked through the colony and counted a total of 243 active nest scrapes containing eggs and/or chicks. Seven inactive scrapes (6 without eggs or chicks, 1 with a dead chick) were also observed. Sixty-six percent of active nests contained 2 eggs, 1 egg and 1 chick, or 2 chicks. Maximum number of eggs per nest was 4. Maximum clutch size for Caspian terns is considered 3 eggs, so the 5 nests that contained more that 3 eggs and/or chicks were likely nests where more than one female had laid eggs. A total of 107 chicks were observed in 75 nest scrapes. Most chicks were 0-4 days old, except one chick that was estimated to be about 10 days old based on the early development of remiges. The chronology of the colony this year appeared earlier than last year because we observed a total of only 8 chicks on June 10, 2008. No predation on tern eggs or chicks was observed during the 20-minute walk-through of the colony. We searched for banded terns using binoculars and spotting scopes from three vantage points around the tern colony. Distance between the colony and the closest observation point was approximately 45 yards. Observations were made before and after the walk-through of the colony. Legs of terns standing on the colony were clearly seen from the closest observation point, and we were also able to see legs of terns sitting on their nests when they were returning to their nests after disturbance events. 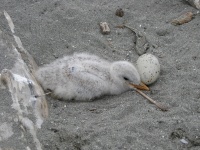 One banded tern was found incubating at least one egg (right leg: yellow band with a code A201, left leg: orange, white, metal from top to bottom). The bird was banded as an adult at East Sand Island in the Columbia River estuary in May 2006 and nested on East Sand Island in 2007 and 2008. This is the first proof of immigration of Caspian terns from the East Sand Island colony to the Copper River Delta colony. Although we did not observe predation on adult terns, eggs, or chicks during the survey, at least two adults and one sub-adult Bald Eagle were seen on the island. Gulls would be potential predators of terns when food availability for gulls in the area is low. Local fishermen have seen bears and coyotes on islands in the Copper River Delta (including Kokinhenik Bar). Because of the vast mudflats and relatively narrow channels between the barrier islands and the mainland, mammalian predators can reach the islands. Even when the tide was relatively high, the depth gauge on the boat we used to visit Kokinhenik Bar in 2008 indicated that the channel near the island was only 4-5 feet deep. Gill (2008) suggests that Caspian tern colonies on marginal habitat in Alaska might not be able to persist under current and projected changes in climate conditions. Kokinhenik Bar is a low lying island which might be potentially subjected to flood when severe storms hit the Copper River Delta region and/or when sea level raises. Multiple visits to the colony during each breeding season would help better understand whether size and productivity of the colony would be affected by such threat. Gill, R.E. 2008. Caspian terns nesting in Alaska: Prophecy, serendipity, and implications for regional climate-related change. Western Birds 39: 97-100. Lohse, T., T. Lohse, T. Lohse, and A. Lang. 2008. First documented breeding colony of Caspian terns on the Copper River Delta, Alaska. Western Birds 39: 94-96.